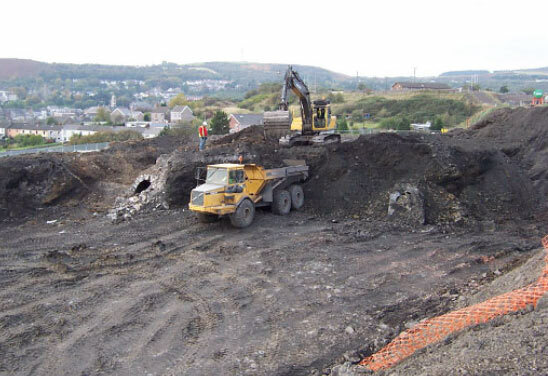 Bridgend Borough Council is currently undertaking a large-scale land reclamation scheme on the site of the former Maesteg Coal Washery site, in order to provide land for a new school and housing. The site has a long history of industrial exploitation, with the site reaching its peak of activity in the later 19th century, when the area supported several small coalmines and a large iron foundry (The Maesteg Ironworks). Because of the industrial interests in the area, Dyfed Archaeological Trust were commissioned by Edmund Nuttall Ltd (the main site contractor) to carry out a multi-phased programme of archaeological investigation. This began with the production of a digital map of the site, which was compiled from historic maps and old site plans in order to locate the former positions of the various industrial buildings across the site. This map was then used to target areas of the site for an on-going watching brief. This is revealing extensive below ground remains of many industrial buildings, including parts of the Maesteg Ironworks and a large bank of mid 19th century coke ovens. Often the buildings are buried below several metres of old coal waste making conditions on the site difficult for archaeological recording. The photograph shows removal of part of the massive build-up of coal waste from the former Maesteg Coal washery site, revealing a stone vaulted culvert (to the left of the lorry) and a partially infilled shaft entrance on the right. This picture gives some impression of the vast amounts of waste material that were generated and dumped during the life of the site, which have created an artificial landscape above the town of Maesteg (in the distance).